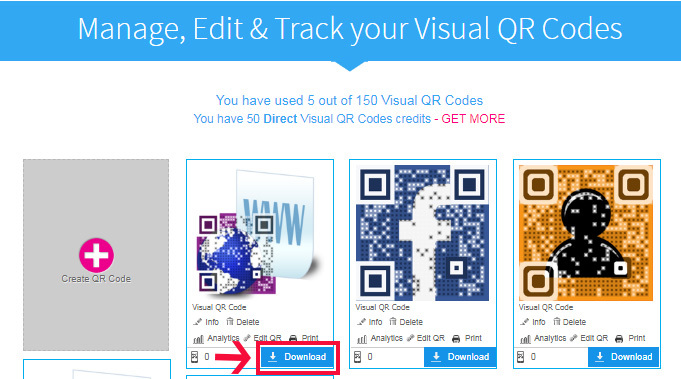 How can you create a direct QR code with Visualead? First, it is important to learn what direct QR codes are. Direct QR Codes are QR Codes in which the destination of the code (for instance, a URL) is embedded physically into the pixels of the code. These were most of the QR Codes that were originally offered on the market as they are relatively easy to create for black and white codes which have no visual appeal, and thus, no limitations as to pixel placement. It is different from what you call Dynamic QR codes. On the other hand, Dynamic QR Codes are QR Codes in which a shortened URL is the only code that is embedded physically into the codes, leaving more leeway for pixel rearrangement and design. When scanned, the destination is accessed via the shortened URL. Direct QR Codes are static ones and by their nature, are active for unlimited time and have unlimited scans, but can't be edited and don't have analytics. 1. 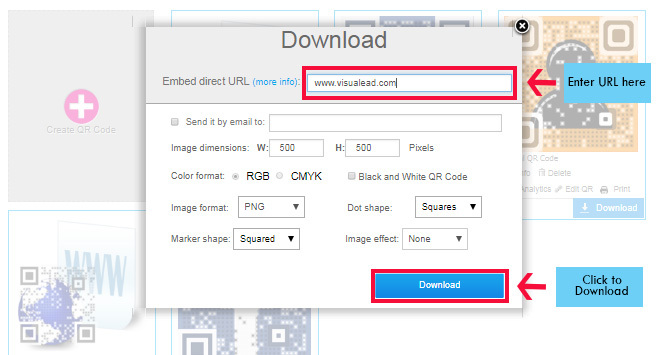 Go to your Dashboard and press "Download" below the Visual QR code that you want to change to a Direct one. 2. Enter the URL you wish to be directly embedded in your Visual QR code in the "Embed Direct URL" box in the pop-up window. Please note that you are limited to 75 characters. Click "Download" at the bottom of the Download window. 3. You will then receive a message that this step will deduct one credit from your account. Thus, you also have to remember that you usually need to purchase credits for your account to make these Direct QR codes work.